The solar storm is likely to last through Friday morning, but the region that erupted can still send more blasts our way, Mr. Kunches said. He said another set of active sunspots is ready to aim at Earth right after this. GEOMAGNETIC STORM UPDATE: A CME propelled toward Earth by this morning’s X5-class solar flare is expected to reach our planet on March 8th at 0625 UT (+/- 7 hr). Analysts at the Goddard Space Weather Lab, who prepared the CME’s forecast track, say the impact could spark a strong-to-severe geomagnetic storm. Expect some major geomagnetic disturbances and don’t be surprised if the HF bands are very quiet while we’re being blasted with electrons. On the plus side? If you live in Northern latitudes, look for some awe-inspiring auroras in the night sky. 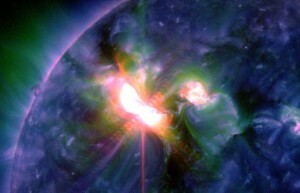 This entry was posted in News and tagged CME, Coronal Mass Ejections, QRP, Solar Flare, Spaceweather. Bookmark the permalink. 2 Responses to Another CME Earth-bound!